Yesterday, my six-year-old and I had nothing planned for the day. I felt tired from the lead up to Christmas- planning her class party, stocking the Advent calendar, hiding that damn elf every night, buying presents, wrapping presents, etc. but I’ve found that with the dynamic of only parent/only child, a “relaxing” day at home usually isn’t very relaxing. 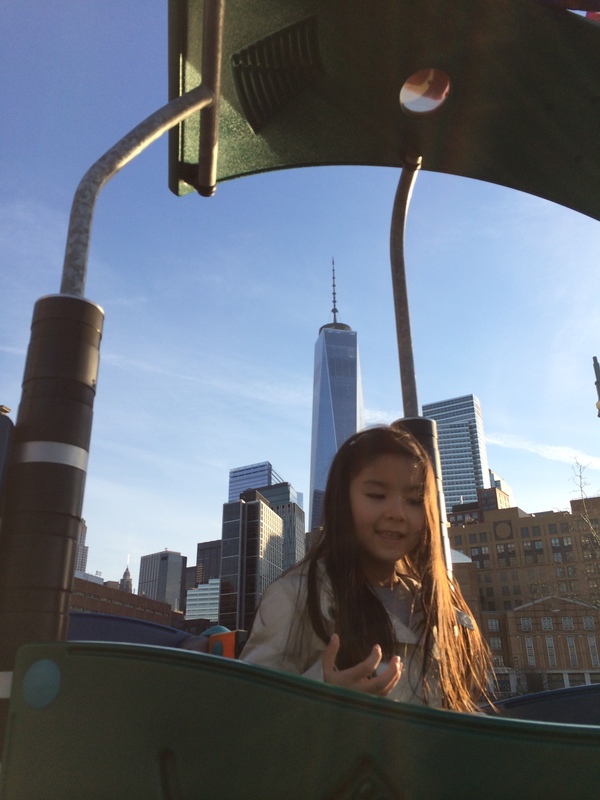 Audrey wanted to visit a playground that happens to be in lower Manhattan, a rather arduous train and subway ride away. Just the thought of it made me tired. A few months after my husband died, there was a second benefit concert held in his honor in Northern Virginia. Then also, I was extremely depleted from intense grief and caring for a two year old. But I thought if I didn’t make the trip there, I might regret it later. I spoke to a close friend on the phone about whether or not I should make the trip and she simply said, “It will be tiring, but you’re already tired here all the time right? So what difference will it make really to be tired somewhere else?” I’m not sure how rational that is, but it convinced me, and I went. I thought of her words yesterday, and I did make one final attempt at sticking around here, “You can’t just play at a playground somewhere in our town? You want to go to that one? “Well, I guess if we stay home, nothing will really happen,” I said. “I want something to happen!” said my daughter, putting on her coat and shoes a bit prematurely. And I guess I did too, so we went. We ended up meeting up with some old friends who were visiting the NYC area from out of town, having lunch, and spending the later part of the mild afternoon at the playground along the Hudson River pier with the Freedom Tower in the background. Last spring I picked up a book called “The Wisdom to Know the Difference.” It’s written by a Quaker and focuses on the Serenity Prayer often used in Alcoholics Anonymous: “God grant me the serenity to accept the things I cannot change, the courage to change the things I can, and the wisdom to know the difference.” I confess I haven’t completed the book, but I was quite taken by the early chapters, which explained that some people veer towards accepting too many things, feeling rather helpless to change them- this is called an external locust of control in psychology terms; while others try to change too many things, and have a harder time accepting them. I definitely err heavily on the side of the external locust of control. So much so that I can remember during job searches after college just sitting around and hoping that I’d get an email asking if I’d like a job I hadn’t even applied for- or even a career I didn’t even know existed. This is a kind of living that leads to drifting, reacting to things that happen to you, but not really working to make anything happen yourself or believing that you’re capable of doing so. Experiencing sudden trauma and tragedy as I did, definitely makes one feel helpless, and for a while all you do is the basics of survival- you breathe, you eat, you try to sleep. I’ve heard grief defined as a loss of courage, and it was certainly easier to take a fatalistic view of life at that time, rather than have the “courage to change the things I can.” Things will happen that will be completely out of your control. Your husband can (and did) drown in a lake in Europe. It’s natural, I think to find oneself in a position of self-defense and preservation, even fight or flight after that, rather than feel that you can change anything. My posture a few years ago was mostly static, mostly survival. If my daughter was napping, I was lying down in bed. Joyce Carol Oates, in her widow memoir, refers to her bed as her “nest,” and it was very much like this for me. Enough had suddenly changed – all I could do was preserve whatever was left, sift through the ruins, and stare at my gaping wound in disbelief. Yet the wisdom of that prayer still holds true. There are still things in your power, no matter how small that power may feel, that you can do. I remember choosing to shower because I rationalized that I already felt awful and adding “feeling dirty” on top of that would be even worse. I chose to go on walks, and I even chose to put a lot of effort into creating a fun play space for my then toddler. But I was still so low-energy that anything I made happen was quite small and close to home. It wasn’t until a few years later when I introduced actual physical movement into my life, that I realized the protective pose I’d been in for about three years. Even the way I sat made me smaller, shoulders curved around, arms crossed, protecting what yogis call “the heart center.” In one of my first yoga classes, the teacher had us place two blocks under us as we lay on our backs, one under the back, and one under the head so that our chest was opened. The extreme vulnerability I felt in this pose made it uncomfortable to hold, and involuntary tears started to stream down my face while I held it, surprising me. I was out of “the nest.” Exposed, vulnerable, but moving. The act of creating is also a form of movement- a way of making something happen- and possibly the preferred way for introverts and artists-but no less powerful. It also takes courage to put words on a blank page, or draw the first strokes of an object with a black pen that won’t erase. After dinner on Christmas, Audrey and I watched Miracle on 34th Street for the third time this season before she went to sleep on the living room floor by the Christmas tree in her new sleeping bag. 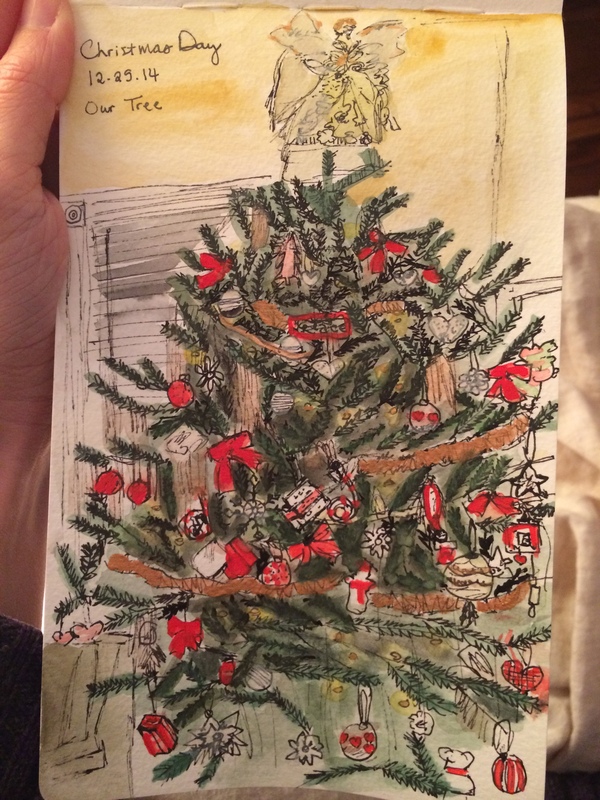 I decided to sketch our Christmas tree while she watched the movie- something I’d been wanting to do for a few weeks. I’d been too intimidated by all those branches and ornaments, lights and dark spaces in between. Where does one begin when a task is overwhelming? To sketch a balsam tree, or fill up a long Saturday, or even, rebuild a life? One of my sketch teachers suggested starting wherever the most interesting place is for you- whatever is most striking. Yesterday, that meant a trek into lower Manhattan to a playground that had left quite an impression on my little girl. I’m not sure it matters as much where you start, as much as just deciding that you’d like something to happen- and to have the courage to move, to open- to make oneself vulnerable- even in tiredness and fear. I start my sketch with a small ribbon hanging from the angel on the top of our tree. It’s no masterpiece, but I fill it in with watercolors and gold and red gouache and I’m satisfied with it. “I want something to happen!” my six-year old had said yesterday morning. By the time we were headed back to Penn station last night for the long journey home, we were both exhausted. “But it was worth it…” said my daughter, rubbing her eyes and laying her head down on my lap on the train ride home. It usually is. You are a wonderful writer – you put into words thoughts and feelings that were inside my head but that I couldn’t find a way to express. Thank you so much Sally. I am trying…I’ll check out your blog as well. Expressing, as above, is the first step towards wisdom. Please continue to help those less gifted in that Art! Definitely will keep trying- thanks for the encouragement Mr. P.!